A device that can instantly identify unknown liquids based on their surface tension has been selected to receive the 2013 R&D 100 Award—known as “the Oscar of Innovation”—from R&D Magazine. 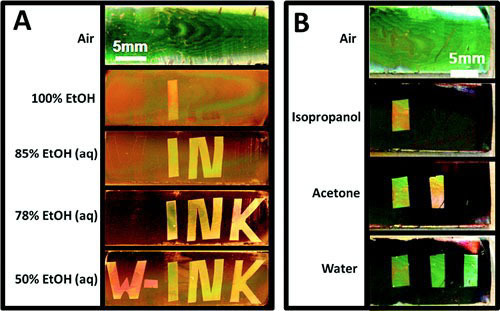 Invented in 2011 by a team of materials scientists and applied physicists at the Harvard School of Engineering and Applied Sciences (SEAS) and the Wyss Institute for Biologically Inspired Engineering at Harvard, the “Watermark Ink” (W-INK) device offers a cheap, fast, and portable way to perform quality control tests and detect liquid contaminants. W-INK fits in the palm of a hand and requires no power source. It exploits the chemical and optical properties of precisely nanostructured materials to distinguish liquids by their surface tension. Winners of the R&D 100 Awards are selected by an independent judging panel and by the editors of R&D Magazine, which covers cutting-edge technologies and innovations for research scientists, engineers, and technical experts around the world. Now in their 51st year, the R&D 100 Awards have long been a benchmark of excellence for industry sectors as diverse as telecommunications, high-energy physics, software, manufacturing, and biotechnology. R&D 100 Awards have identified pioneering new technologies such as the flashcube (1965), the automated teller machine (1973), the halogen lamp (1974), the fax machine (1975), the liquid crystal display (1980), the Nicoderm anti-smoking patch (1992), Taxol anticancer drug (1993), lab on a chip (1996), and HDTV (1998). Aizenberg says she envisions a broad range of industrial and consumer applications—for example, detecting toxins in a chemical spill; testing alcohol levels or the quality of gasoline, sugar or caffeine; or the creation of simple teaching sets and toys. The project was a collaboration between Aizenberg and Marko Loncar, Tiantsai Lin Professor of Electrical Engineering at SEAS. This is the second time in a row that Aizenberg’s team has won an R&D 100 Award. In 2012, her research group was recognized for their invention of an extremely low-friction material called SLIPS, for “slippery, liquid-infused porous surfaces.” Inspired by the pitcher plant, SLIPS resists liquid, ice, and dirt and could be incorporated into a wide range of products, from medical devices to refrigerators. The W-INK concept relies on a precisely fabricated material called an inverse opal, a layered glass structure with an internal network of ordered, interconnected air pores. Akin to the litmus paper used in chemistry labs around the world to detect the pH of a liquid, the W-INK device changes color when it encounters a liquid with a particular surface tension. 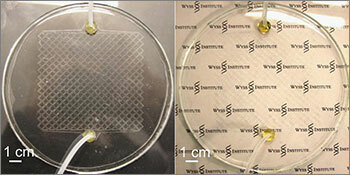 A single chip can react differently to a wide range of substances; it is also sensitive enough to distinguish between two very closely related liquids. Selectively treating parts of the inverse opal with vaporized chemicals and oxygen plasma creates variations in the reactive properties of the pores and channels, allowing one liquid to pass through while excluding others. When the correct liquid enters a pore, the chip reflects light differently, producing a telltale change in color. Aizenberg and Loncar were joined in the initial research by Ian B. Burgess (who was a Ph.D. student at Harvard SEAS at the time and now a postdoctoral fellow at the Wyss Institute), Lidiya Mishchenko (a graduate student at SEAS), Matthias Kolle (a postdoctoral researcher at SEAS), and Benjamin D. Hatton (a research appointee at SEAS and a technology development fellow at the Wyss Institute). Winners of the R&D 100 Awards will be recognized at a ceremony in November 2013. In addition to her roles at Harvard SEAS and the Wyss Institute, where she leads the Adaptive Materials Technologies platform, Joanna Aizenberg is the Susan S. and Kenneth L. Wallach Professor at the Radcliffe Institute for Advanced Study; Professor of Chemistry and Chemical Biology at Harvard; and co-director of the Kavli Institute for Bionano Science and Technology at Harvard. • the U.S. Department of Homeland Security (DHS), administered by the Oak Ridge Institute for Science and Education, through an interagency agreement between the U.S. Department of Energy and DHS. Additionally, electron microscopy was performed at Harvard’s Center for Nanoscale Systems, part of the National Nanotechnology Infrastructure Network, which is supported by the National Science Foundation.